I was all enthusiastic upon seeing the "looks really easy" recipe of Garlic and Cheese Scones somewhere a couple of days before. Therefore I bought what was needed except for the baking paper and board, put my never ending assignments aside and hid in the kitchen. Sigh... 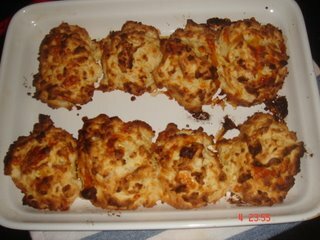 I made scones that doesn't look like scones in any way. I tasted it and I felt like chucking, it tasted awful. I'm just gonna throw them away when it's not too hot for me to touch. Ewww... what a shame. Had a pajamas day today - hiding at home in pajamas, watching tv, go online, pretending to be working on my assignment, making and drinking hearty vegetable soup and of course, that awful scones. I've finally gave in to my withdrawal symptoms from shopping - I bought a pair of discounted Pura Lopez yesterday, well, at least I didn't buy anything full price. I deliberately went shopping only 20-mins before the shops shut, good strategy. And since I had time to kill before dinner, I went for a massage. The place was good but not good enough for me, will have to try out a new place next week at Prahran. I did not expect W to be so upset about the surprise dinner. The whole best-friend-turns-enemy saga was a little too much for everyone to handle on a relaxing rainy Sunday evening. I apologize(d), they apologize(d), but he still acted like a woman, well, theoretically he is one. Can't be bothered, the sun still shines and all we can do is not to have surprises/jokes in the future but apparently he was very uncomfortable and was having the mixed feelings of awful + upset + disappointed + shock, that lasted till today. Enough of that questionings and apologies 24 hours later. I'm a woman but I don't see a reason to be building up "mixed feelings" towards you. In fact, I've other better things to do in a day, like talking to other happy people. I wasn't upset (like you do), therefore, I need no apologies or explanations. Thank you. About 'those things', all I can say is... I made the impossible possible again! Tracy, some gay who doesn't get to get laid recently. Roy, when are you not blur? yah...who is the hewoman la? ?